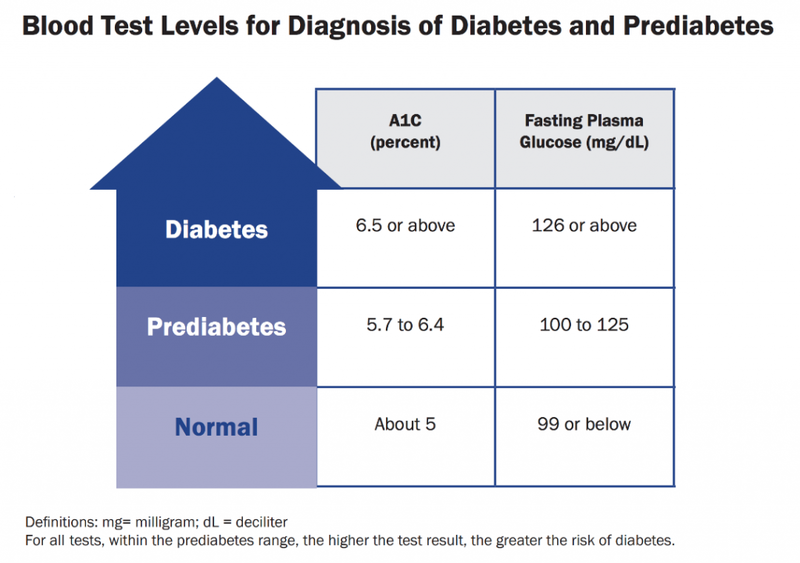 Prediabetes – What Is It and Why Should I Care? Have you or someone you know been diagnosed with prediabetes? If so, you’re not alone. And if you’ve been diagnosed with prediabetes, you likely have a million questions. I know I did! Wouldn’t it be nice if someone could answer questions about prediabetes and clear-up feelings of confusion and frustration? That’s exactly what I hope to do in this 3-part series on prediabetes! What are symptoms of prediabetes? Do I really need to be concerned? So let’s get started with the basics. Prediabetes is diagnosed based on the results of one or more common blood tests—A1C or Fasting Blood Glucose—prescribed by your doctor. As you can see from the image below as your test results increase you move from Normal to Prediabetes to type 2 Diabetes. When you are diagnosed with prediabetes, your doctor may closely monitor your blood sugar levels to track the progression of your condition. You may be placed on a diet and encouraged to increase your physical activity levels as a way to keep your numbers stable. Depending on your situation, your doctor may also suggest a drug treatment such as Metformin to help lower your blood sugar. A1C and Fasting Blood Glucose: What’s the difference? As the diagram above shows, there are two primary blood tests used to determine the about of glucose in the blood—A1C and Fasting Blood Glucose. Your doctor may prescribe these two tests during an annual exam as part of a more complete series of tests to get an idea of your overall health. The A1C test is a blood test that provides information about your average levels of blood glucose, also called blood sugar, over the past 3 months. The results of an A1C test can be used to diagnose type 2 diabetes and prediabetes. This test is also the primary test used for diabetes management. A1C tests are sometimes called the hemoglobin A1C, HbA1c. Hemoglobin is the part of a red blood cell that carries oxygen to the cells. Glucose attaches to or binds with hemoglobin in your blood cells, and the A1C test is based on this attachment of glucose to hemoglobin. The higher the glucose level in your bloodstream, the more glucose will attach to the hemoglobin. The A1C test measures the amount of hemoglobin with attached glucose and reflects your average blood glucose levels over the past 3 months. They report the results of an A1C test as a percentage. The higher the percentage, the higher your blood glucose levels have been. A normal A1C level is below 5.7 percent. The fasting blood glucose test provides vital clues about how the body is managing blood sugar levels. Blood sugar tends to peak about an hour after eating and declines after that. High fasting blood sugar levels point to insulin resistance or diabetes. Abnormally low fasting blood sugar could be due to diabetes medications. Following a meal, blood sugar levels rise, usually peaking about an hour after eating. How much blood sugar rises by and the precise timing of the peak depends on diet. Large meals tend to trigger larger blood sugar rises. High-sugar carbohydrates, such as bread and sweetened snacks, also cause more significant blood sugar swings. Normally, as blood sugar rises, the pancreas releases insulin. Insulin lowers blood sugar, breaking it down so that the body can use it for energy or store it for later. Blood sugar levels in between meals offer a window into how the body manages sugar. This is why you will be asked to fast for up to 8 hours before having this test done. High levels of fasting blood sugar suggest that the body could not lower the levels of sugar in the blood. This points to either insulin resistance or inadequate insulin production, and sometimes, both. Who’s at risk for prediabetes? You can take a quick test to see if you are at risk here. You’ll notice that being overweight is one of the risk factors listed above. This is a very serious issues as nearly all those who are overweight or obese—roughly 70% of American adults—already have prediabetes. There usually aren’t obvious symptoms when you have prediabetes. This, in part, is why so many millions of people have prediabetes but don’t know it! That’s why it’s important to talk to your doctor to know for sure. A simple blood test can confirm if you have prediabetes. Remember, as stated earlier, prediabetes is diabetes. If you’re diagnosed with prediabetes, you’ve been given a unique second chance that most diseases don’t offer. Without making changes, many people with prediabetes can develop type 2 diabetes within 5 years. If you don’t make lifestyle changes, it puts you at greater risk. 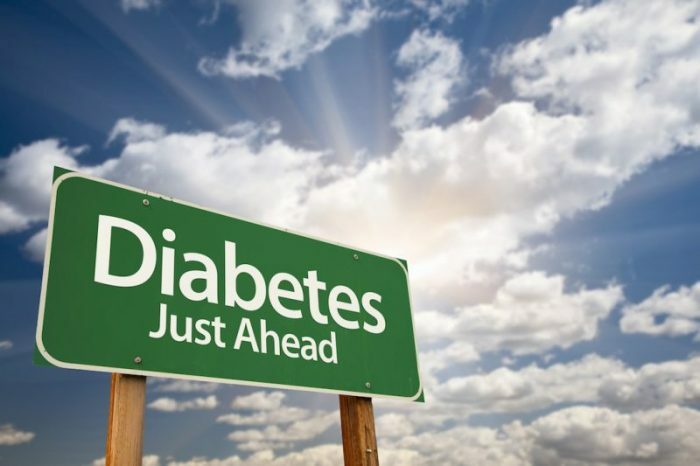 Studies have shown that simple lifestyle changes can reverse prediabetes or delay the slide into full diabetes (3). If you have been diagnosed with prediabetes, heed the wake-up call and take advantage of the second chance you have been given. There’s more to this than you realized? After reading this article, you might feel like prediabetes is more complex than you thought. We get it. In the age of 24/7 health news and fitness-celeb podcasts, it’s tough to get the real story. If you’d like to learn more about how making lifestyle changes can help to reverse prediabetes, consider the PreventT2, Diabetes Prevention Program. This CDC-recognized lifestyle change program is proven to work. It is based on research led by the National Institutes of Health. What’s the PreventT2 program all about? PreventT2 is part of the National Diabetes Prevention Program, led by the Centers for Disease Control and Prevention. It is proven to help people with prediabetes prevent or delay development of type 2 diabetes. The PreventT2 is the world’s most respected diabetes prevention program. It gives you the knowledge, systems, and tools to understand how lifestyle change influences a person’s health and fitness and helps to delay or prevent type 2 diabetes. This research showed that people with prediabetes who take part in a structured lifestyle change program can cut their risk of developing type 2 diabetes by 58% (71% for people over 60 years old). This finding resulted from the program helping people lose 5% to 7% of their body weight—as little as 10-14 pounds for a person who weighs 200 pounds—through healthier eating and 150 minutes of physical activity a week. And the impact of this program can last for years to come. Research has found that even after 10 years, people who completed a diabetes prevention lifestyle change program were one third less likely to develop type 2 diabetes. Yes, being diagnosed with Prediabetes can be scary and even frustrating to deal with. But with a little knowledge and an action plan it doesn't have to be. Making a few simple lifestyle changes can help to put you back in control of the diagnosis and your health. I designed the articles in this series educate you and to help you identify the changes you need to make to reverse Prediabetes and delay or prevent type 2 diabetes. I hope this post inspires you to take action and make some changes in your life to prevent type 2 diabetes. I'd love to know what you think of the information presented here, let me know by leaving a comment below! You can also join our private Facebook Group here. A diagnosis of Prediabetes can be scary and confusing. Get the answers you seek to the most frequently asked questions about Prediabetes . . . Uncover what prediabetes really is and what it means for you. Learn what all those confusing blood sugar numbers mean. Perreault L. Goals for Medical Treatment in Obesity and Prediabetes: Improving Outcomes. Presented at: AACE Annual Scientific and Clinical Congress; May 16-20, 2018; Boston.